In a recent report by Transparency Market Research (TMR), the vendor landscape of the global software defined networking market is anticipated to witness commendable growth opportunities for players in the future years. This is because of the entry of new players into the market who have brought up new strategies of collaboration and merging in order to produce better outcomes. Leading companies are also focusing on including only those players who have already attained expertise in the field even before entering the market. This may act as a barrier for new players but to get a stronghold on the revenue share and in order to get more profits, it is important to impose restrictions for the players. Some of the leading players of the global software defined networking market are Intel Corporation, Big Switch Networks, Verizon Communications, HP, IBM, and Cisco. The key players are mainly focusing on new merger and acquisition methods in order to obtain a stronghold in the market and also to bring more revenue share to the overall market. Apart from that, the market is presumed to accelerate with the strategic alliances to be implemented in the years to come owing to the exponential demand for software defined networking over different industries and firms worldwide. As per the TMR report, the global software defined networking market is expected to earn a US$3.52 bn by the end of 2018. Within the forecast period of 2012 to 2018, the market is expected to expand to 61.50% CAGR. On the basis of solutions, the cloud provisioning and orchestration segment is anticipated to hold the majority of shares in the market owing to maintenance of resiliency and the traffic balance between the servers. The global software defined networking market is dominated by the regions of Asia Pacific, Europe and North America. Among them, North America is presumed to be the largest contributor to the overall market. Besides that, Asia pacific is also anticipated to grow at a faster rate during the forecast period because of the emerging trend of bring your own device or BYOD in its developing nations of China, Japan and India. Apart from that, almost about 70 % of the market in Asia Pacific is inclined towards owning smartphones. This serves as an opportunity for the overall growth of the software defined networking market in the coming years. With the use of software defined networking, a higher dynamic scale can be managed and programmed with more flexibility and agility. A clear understanding of the software defined networking technology is important in order to effectively implement cloud computing services in company firms for optimizing their network environment benefits. With time, the urge for digitalization is increasing and so is the need to provide efficient network infrastructure in organizations as well. Although the growth in cloud computing services is drawing more profit to the market, the lack of awareness among end users and buyers as well as the lack of standardization in terms of software networking may hamper the growth. Not only that, the presence of interoperability issues in systems may also restrict growth of the software defined networking market globally. However, rapid network technological advancements and bring your own device (BYOD) policy in various organizations aids as an opportunity for the global software defined networking market. 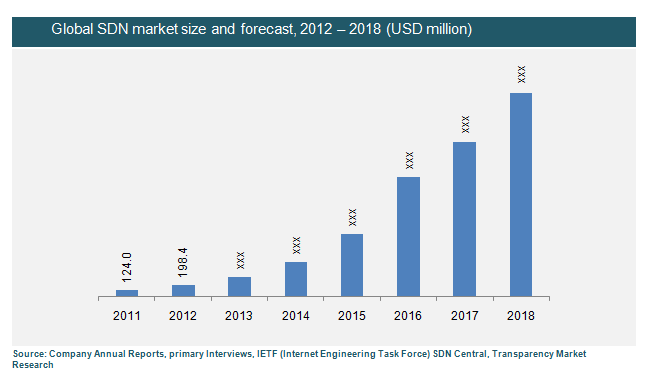 The information presented in this review is based on a TMR report titled, “Software Defined Networking (SDN) Market (Solutions - Cloud provisioning and orchestration, SDN controllers, and SDN switching; End users - Telecommunications service providers, Cloud service providers, and Enterprises) – Global Industry Analysis, Growth, Trends and Forecast 2012- 2018”.